Read the full review on The Horror Bookshelf. "Perfectly paced from the first sentence, these stories grab you by the collar with the urgency of mortal danger. Highly recommended." "Thorn presents a collection of horror stories that are not only scary, but also intelligent, thoughtful, and carefully planned confronting the anxieties of modern life." "Just read the opener, 'Hair' and became an instant fan. How can you not delight in a story about a metalhead fixated on long hair who starts obsessively eating it until hair begins to... um, well, buy Darkest Hours now and find out." "When you first encounter Thorn’s writing, a number of qualities impress themselves: the macabre intelligence (brutal really), the chilling wit, the naturalness of the dialogue. Plus there’s the skill and style of the prose. It may all play out like a nightmare, but a terrible logic remains inherent." "These short stories show the author's incredible range and versatility." "Fast, fun and full of fear, Darkest Hours turns on a dime from a laugh to a scream. Terrifying and sly, Mike Thorn writes with refreshing originality and hides fangs behind a smile." "Mike Thorn's debut story collection is not to be missed by those who enjoy an academic intellect with a potent flair for fiction." "Take a dollop of Michael A. Arnzen and Brian Evenson’s quirky styles, and add a pinch of Mark Twain, stir well and let bubble, and you have a sense of Mike Thorn’s stories." "I think Mike Thorn is an author to watch. I think he's going to do great things in the world of horror and dark fiction, and I for one, will be there to watch it. Will you?" "Darkest Hours is for readers wishing to take a thrilling walk on the dark side. Mike Thorn has delivered a promising debut with this collection showing off his commitment to stories of nuance, heart, and of course… darkness." "Darkest Hours is a varied and hugely enjoyable gathering of dark fiction. There is more than enough talent showcased within these pages to suggest that Mike Thorn’s journey has only just begun." "Darkest Hours is horror for horror people. For the 'confirmed ghost story and horror film addict,' if you will. But it’s also for people with strong emotions and a desire for philosophical thought." "There are times in Thorn’s prose where I’m reminded not only of some of the best Stephen King from Skeleton Crew or Night Shift, but also of some of the more bizarre stories from Clive Barker’s Books of Blood." "The stories are clever and witty. The characters are all too real." 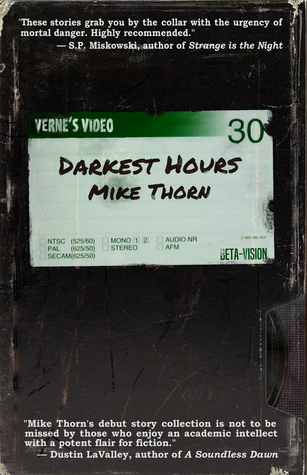 "Mike Thorn’s Darkest Hours contains the most diverse selection of stories that I’ve ever read from a single author."